I look tired unless I wear eyeliner (or tons or mascara) and right now I’m totally into Estee Lauder Double Wear Stay-in-Place Eye Pencil in Bronze. I used to be a black eyeliner loyalist -- I just couldn’t find the right shade of brown to compliment my eyes -- but after trying this slightly shimmery dark brown liner, I’m hooked! It gives my eyes definition and depth, and the metallic sheen gives just the right amount of brightness to the eye area. I’m loving it as my everyday look -- no more harsh black liner in the gorgeous summer sun. The creamy formula glides on smoothly and really does last all day. 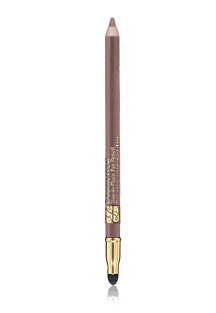 It’s advertised as a 12-hour wear pencil, and I put it to the test. No amount of smudging or eye rubbing (I know eye rubbing is a no-no, but there’s just so much dust in the city!) could get this beauty off my eye. I even went for a swim and it lasted until I washed my face in the shower! How amazing is that! Estee Lauder Double Wear Stay-in-Place Eye Pencil retails for $19. Disclosure: This product was furnished by a PR representative for Estee Lauder. I was just thinking yesterday that I wanted an eyeliner that was not harsh and dark. I can't wait to try it!